Whirlwindis the first book to tell the complete, awe-inspiring story of the Allied air war against Japan-the most important strategic bombing campaign in history. From the audacious Doolittle raid in 1942 to the atomic bombing of Hiroshima and Nagasaki.In 1945, award-winning historian Barrett Tillman recounts the saga from the perspectives of American and British aircrews who flew unprecedented missions over thousands of miles of ocean, as well as of the generals and admirals who commanded them. Whirlwindis one of the last histories of World War II written with the contribution of men who fought in it. With unexcelled macro- and micro-perspectives, standing as a reference on the war, on multi-service operations, and on the human capacity for individual heroism and national folly. "A well-written, bright and insightful tour of the last definitive period of the Pacific war. . . . Tillman is one of this country's most respected aviation historians. . . . It's all here with the usual Tillman stamp of authority and occasional grim, irreverent humor. . . . "Whirlwind "will not disappoint." --Peter Mersky, "Wings of Gold "
"Barrett Tillman is one superb military aviation historian. . . . An epic story told by a master historian." ""Whirlwind . . . "offers an impressive 360-degree look at the air offensive against Japan's home islands. All of the story's major elements are here, as well as some frequently omitted. . . . While several worthy books have covered aspects of this air effort, none offers the comprehensive inter-service and international perspective of this concise account." 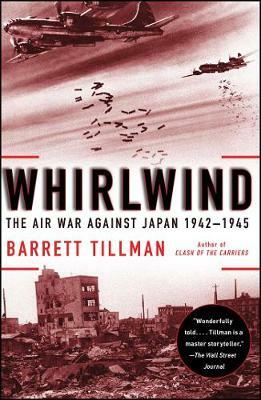 ""Whirlwind" is a definitive history of the WW II air assault on Japan and is superb reading. I highly recommend it as a must for all military historians." --Cdr. Doug Siegfried, USN (Ret), "The Hook"
"Barrett Tillman's "Whirlwind" is a concise, rigorous and authoritative miracle of military history. It's also a great read. I couldn't put it down." --Stephen Hunter, author of "I, Sniper" and "The 47th Samurai"
"""Whirlwind" has the critical elements to separate it from the pack of cockpit and command aviation histories: it is vivid, lucid and human. But it is something much more: it provides the essential foundation for the examination of the impact of conventional airpower as a fundamental cause of Japan's surrender." --Richard B. Frank, author of "Downfall: The End of the Imperial Japanese Empire"
"A sparkling tale of one of the most fascinating battlefronts of World War II. Tillman pulls together the aerial battles, planning sessions, kills and sacrifices into a coherent narrative that will leave readers pondering the fate of nations and individuals in war, when the call is often to perform the impossible and the call is met with surprising frequency." --Robert W. Merry, author of "A Country of Vast Designs"